Those who get the reference, hit this! They’ve ripped up the train track around here. If George Osborne doesn’t pull the plug, the plan is that the trains which used to run the loop from Manchester through Oldham to Rochdale will be replaced by spanking new trams. To us, what this means is an opportunity to sneak onto a lovely, temporary cycle track of the type so loved by Sustrans. Old rail tracks are usually pretty even and not too steep so they make ideal family trails. Trouble is, this one’s supposed to be a building site. “Ah, what the hell, let’s give it a whirl”, we thought! I took my son along to make things look like we weren’t looking for trouble (officer), and because I knew he’d see it as a bit of an adventure. Also, when he’s a grown man travelling on the line himself, he’ll remember the day he cycled it incognito with his Dad. 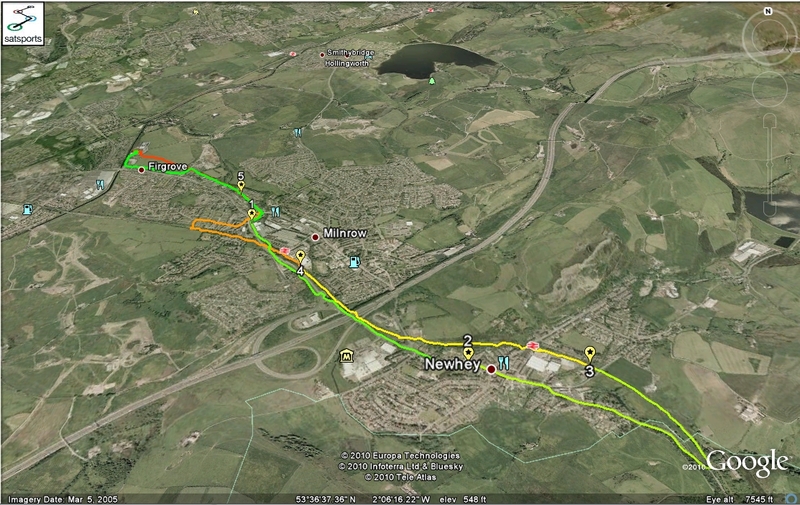 We got onto the track easily near Jubilee Bends, Newhey. 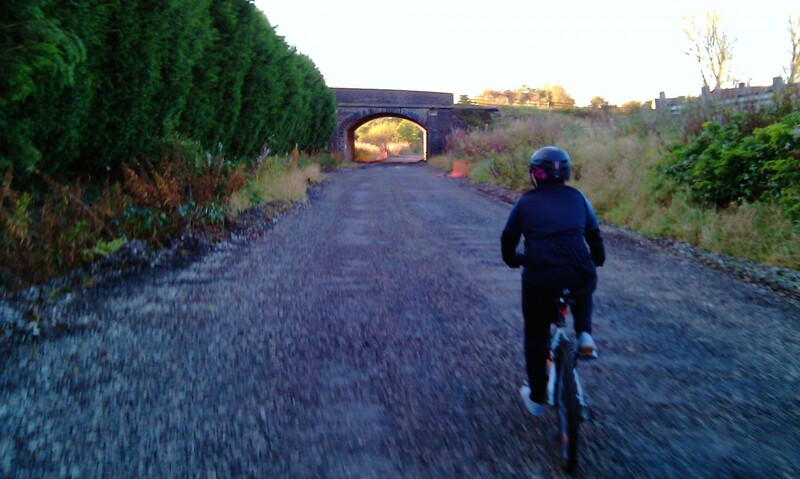 There’s an unmanned level crossing so we used the cycle gate and on we went. This was a couple of miles from home, so we headed back towards Rochdale. 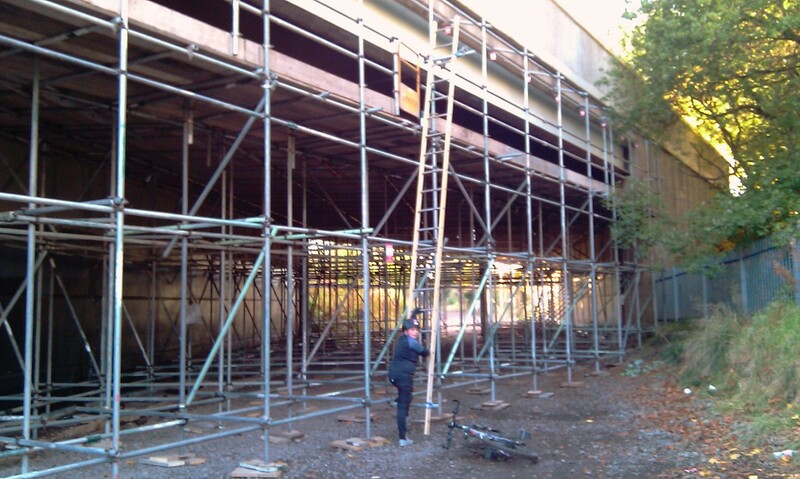 There was only one awkward bit, where a road bridge was almost totally obscured by scaffold, but we found a path through. No we weren’t. The police helicopter was in the sky not far away the whole time we were riding, which lent a certain frisson to Number One Son’s ride. When you’re 12, you actually believe they care about a bloke and his lad trespassing harmlessly on the railways. But they didn’t notice us. I think. If you see me on Crimewatch next month, please don’t call them. We rode along and I took a few photos before I dropped my phone and fell off my bike. Then I had an attack of sensibility and before long we decided to get home for tea. Scrambling up an embankment near Milnrow, we hopped over a bridge wall and headed back home via Firgrove playing fields. The Oldham Train Loop. Yes, Train Loop. Thought We’d Have To Stop Here. We didn’t. I was seriously thinking about cycling down a brand new unopened road when I was in France last month….Didn’t have the balls in the end! Not sure how I would have coped speaking to the frogies when I was blatantly in the wrong! Ha ha John, maybe not referring to them as “the frogies” would have been a good start! It was a fun little trip. You can’t go around putting “caught by the fuzz” on a blog entry. What kind of people are you going to get coming across from a Google search now? Whilst we’re all confessing, I turned right at a temporary no right turn sign the other week. Sorry. I shall try not to do it again. I rode my hybrid with the tyre pressures a bit low on Sunday – does that count as rule-breaking?!?!? I must admit that when riding through Dunwood Park I’ve gazed over on to the track thinking it would make a really good cycle track to Manchester. Haven’t been to Manchester since they stole our trains and its going to cost much more on a tram than it did on a train. How much room does a tram take up anyway. You’d think they could integrate a cycle route alongside the tram like they do in Holland and other cycle friendly places. The point about the track being a great cycle path is an excellent one. If only they’d find a way to incorporate a cycle path it’d be excellent, but with private investors putting the trams in, they’d never support it would they? That’s where we need proper public servants making the decisions, and proper public funding.